Last Sunday, a benefit concert was held in Williamsburg, Brooklyn in honor of my husband. Rachel Platten had united the music community he played with after she and I had corresponded back in June and this is what they’d come up with: a benefit concert on the exact same date as the first one five years ago just after he died. This time, instead of sleeping at home in her crib, Audrey got to come. She even got to get on stage and sing “Fight Song” with Rachel. It was an emotional, poignant evening, but there was one subtle moment, as they often are, that really stood out for me. One of the singers who performed was from our favorite Scottish band, Travis. My husband and I had loved that band, and their songs had been important bookmarks in our lives. “Flowers in the Window” was our wedding song. “My Eyes,” written when the lead singer’s wife was pregnant, was the song we listened to when I was pregnant. Fran Healey, the lead singer, had only connected with Dan on MySpace about Dan possibly recording some cello tracks with him, but he had been so charmed by my husband that he’d dedicated his next album to him, and come to meet Audrey and I at this concert and play my favorite songs. Hearing him play the songs, just for us, without my husband there, was bittersweet and surreal- like another final gift from him to me. But that is not the moment I want to tell you about. I wanted to record Fran singing the songs on my phone, so I could always have them. 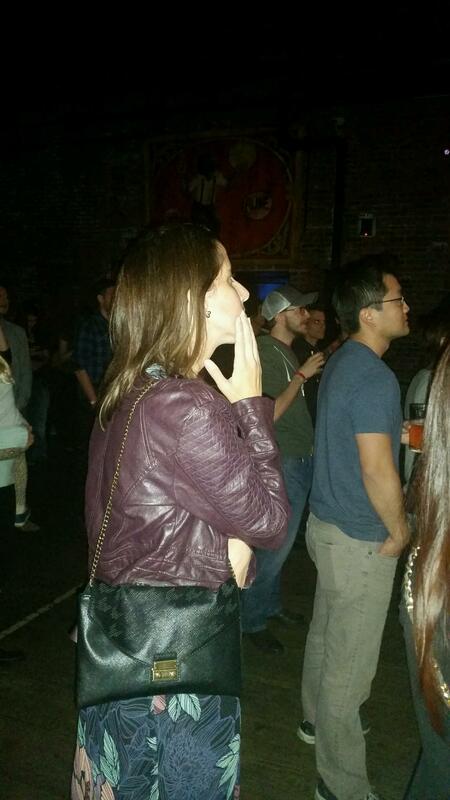 But I also wanted to be present in the moment, watching him sing, not looking through my small screen. So I was trying to hold my phone to the side, but keep it steady and film while also looking up at Fran on stage. Towards the end of the first or second song, I felt someone touch my back gently, and ever so gracefully, so swiftly, take my phone from my hand and keep recording smoothly. “You enjoy,” she said quietly without looking at me. And she filmed the rest of his set while I stood unencumbered, watching the last few minutes. The friend who took my phone isn’t someone I know very well, or someone I’ve seen a lot over the last three years, but she came out for the concert with a few other friends, as she has come alongside me a few other times when I needed her. Quietly, gently, without being asked. Around the same time my husband died, her 18 month old son was diagnosed with cancer. Somehow, despite and because of her own suffering, she came through for me. She saw me write on my old blog that Audrey loved blueberries, and volunteered to drop off a special birthday cake for her second birthday covered in beautiful berries. I never even saw her because she left it downstairs with the concierge of the building. 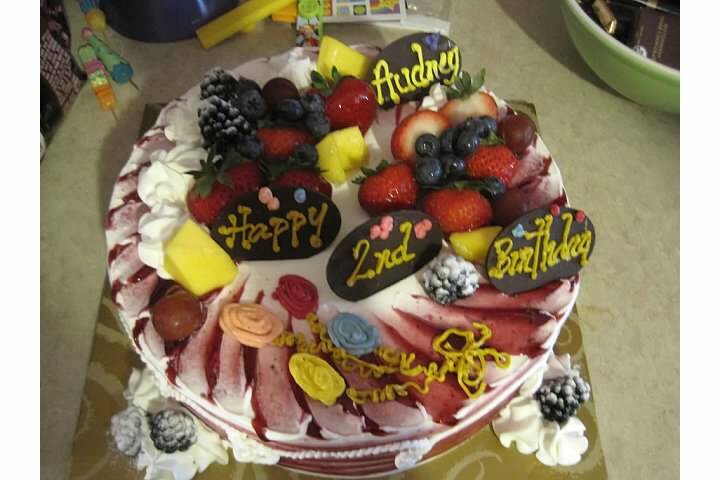 But I remember that beautiful cake and have photos of it in Audrey’s second year album. Later, when I was trying to buy a house- she looked at the listings that I sent her because she had real estate experience. When I finally had to pack up and move, she came to my apartment with a ton of boxes and furiously helped me pack. When just about everything was packed, except a beautiful framed family photo of Audrey on her first birthday and Dan and I kissing her on either side, she stood by, alongside me, while I took it down. She held me while I cried right after. After I moved, she came over with paintbrushes and rollers and helped me paint Audrey’s small room pink as she’d requested. My new apartment was covered in boxes. Audrey was sleeping at my parent’s house, and I felt very alone. She took off the outlet covers and light switch covers and got to work. Then, she disappeared again. I probably didn’t see her until I ran into her in Trader Joe’s a couple of years later. Then it was just a quick hello as someone had just accidentally stolen my cart with all my food in it, and I was a bit flustered. And then- at this concert two Sundays ago. There she was again. And in that moment, when she ever so softly took my phone and whispered, “You enjoy,” the word “alongside” came into my mind. It’s one of those words that we don’t use very often in modern life, but what a beautiful word. I had learned years ago that Paraclete was the word for the Holy Spirit coming from the Greek meaning “to come alongside,” and that He was also known as the Comforter. With her gentle spirit, my friend had personified this kind of coming alongside, this kind of comfort. She’s not the only one who has done so. I have another friend who comes in and out of my life and always seems to arrive when I am going to a scary doctor’s appointment, so she accompanies me. She was there when I tried to get a closed MRI and had to keep coming out three of four times because of claustrophobia until I nearly passed out. She yelled at the rude nurse and took me out to lunch afterwards. She was there when I had to get my first mammogram last year because of some pains in my chest. She sat with me in the waiting room and reassured me as I panicked when they called me back in for a second round of photos. She is driving me to and from the endoscopy procedure I am having later this week. Another friend came with me to buy my husband’s headstone, and came to my apartment the day of my move to wait for the movers with me. She was near me as I closed the door to that apartment for the last time. She drove me to the cemetery, and met me for lunch when my father in law died suddenly. These are just a few of the people who have been a support to me. They come to mind because I don’t see them often. But somehow that makes those moments of “coming alongside” resonate even more strongly. No one can be expected to be there for someone all the time. I never expected that in my own time of need. But do not discount the power of coming alongside someone- just for a few days, or one day, or even just for a moment. In one moment, you can hold someone while they cry, even if you don’t know them that well. In one moment in a darkened music hall, you can slip their phone out of their hand and into yours and whisper, “You enjoy…” It may be a moment that carries them, or saves them; it will probably be a moment they never forget. thank you for this post. Your words make the experience come alive and I felt like I was experience the warmth of those who came “alongside” you while reading it. I look forward to reading more posts! I agree- there were moments of feeling let down and definitely a slippery slope towards bitterness. I credit my grief counselor- that she helped me frame even that in a positive way- that during that “alone time” God wanted me to learn something or reflect on something without so many people around. But she also pointed out that He would provide everything I needed- so I looked at friends popping in and out when I happened to need them in that larger context rather than just evaluating the friendship. Thanks for the good wishes. It was just an endoscopy, but I have a lot of anxiety- so thankful it’s done! As Planet Grief mentioned, it is easy to be irritated by the friends who have let us down, but it is beautiful to be able to recognize the ones who have been and are continually there even if not constantly. I’m glad you were able to see that. You are surrounded by many wonderful friends and family who love and care for you and A deeply. Thanks J. I’m sure you’re able to see the same…thanks for being one of them. Oh Julia. The tribute sounds like a beautiful honor to your husband, but what a surreal and strange experience for you, to be there among the throngs, yet be invisible to most in attendance. I’m sorry Audrey wasn’t feeling well, but glad she had a chance to sing Fight Song with Rachel. I’m also so glad of the gift that friend was able to give you. Being alongside those in such deep pain can be intimidating to the uninitiated, but like you write here, even coming in and out of someone’s life, standing alongside, witnessing, holding, even if it’s only a handful of times, or once, is a gift worth offering. Thanks Dana. It was a beautiful tribute. Beautiful writing. To have your friend just whisper “you enjoy” made me get goose bumps. To be among so many and still feel alone very bittersweet. I’m sure your husbands spirit was felt. So sorry Audrey wasn’t feeling well. Thanks Glenda. I’m glad it came through how precious it was when she whispered that to me. Beautiful writing as always. My mom went Home last Sunday… Wondering if you could point me to a few books that would be helpful to start healing in the early stages of grief? I highly recommend a little daily meditations book called “Healing After Loss.” It’s full of really profound, but uplifting thoughts and quotations. I found it for 25 cents at my library once randomly a year or so ago, but was surprised at how wonderful it ended up being. You can find it on Amazon here: http://www.amazon.com/Healing-After-Loss-Meditations-Working/dp/0380773384 If you aren’t sure where to begin- I’d start with that one.